Hiroshima Speaks consists posters of photos from the bombing of Hiroshima. The posters include text as well as image. This powerful exhibit shows the consequences of the bombing of Hiroshima. The exhibit questions the use of nuclear weapons then and our responsibility for humanity's future. 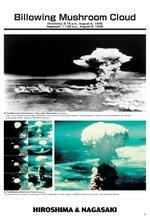 Hiroshima Speaks consists of 37 24½â€ x 35½â€ posters of photos from the bombing of Hiroshima. The posters include text as well as imageâ€”some are very graphic, others scientific text and image. Included with the exhibition are two poignant dvdâ€™s: Hiroshima Witnesses: Hibakusha Testimony and Hiroshima: A Motherâ€™s Prayer. Also included is a booklet of printed drawings from survivors, mostly children. Submitted by Deale A Hutton (hutton@oswego.edu) on 2009-06-04. Made available in DSpace on 2009-06-04T18:11:05Z (GMT).